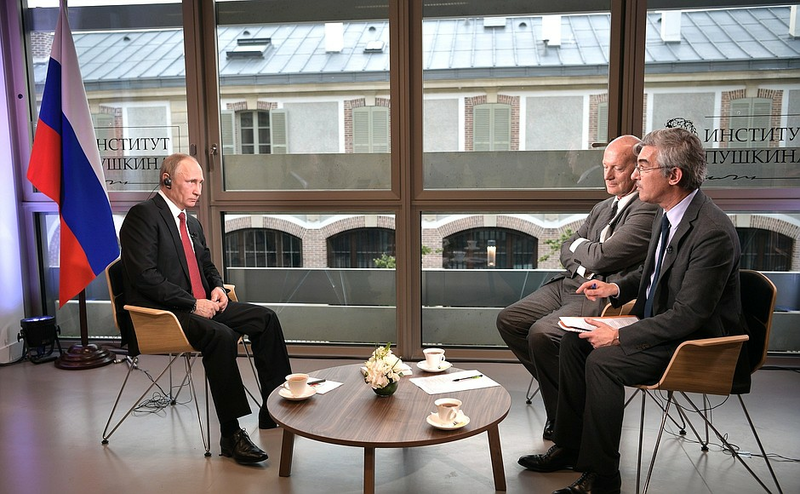 The interview was recorded on May 29 in Paris during the President’s visit to France. Question (retranslated): A very good afternoon. Thank you very much for agreeing to answer questions from Le Figaro. I would also like to thank you for meeting with us here, in a classroom at the Russian Cultural Centre. Once again, thank you for granting this interview. You came to France in order to open an exhibition that marks 300 years since the establishment of diplomatic ties between Russia and France. There have been highs and lows in the relations between the two countries. What is your perspective on the current state of these relations? Vladimir Putin: It is true that President Macron invited me to take part in the opening of the exhibition. However, let me tell you straight away that the relations between Russia and France have a much longer history and much deeper roots, as the French President and I both mentioned on several occasions today. In fact, the younger daughter of Yaroslav the Wise, one of Russia’s Grand Princesses, Anna came here in the 11th century to marry King Henry I of France. She was actually called Anna of Rus, Queen of France. Her son Philip I of France was the founder of two European royal houses, the Valois and the Bourbons, and the latter rules in Spain to this day. This goes to say that the roots of our relations go much deeper, although over the last 300 years they did pick up momentum. This is true. I very much hope that today’s event, the exhibition and my talks with President Macron will give a new impetus to these relations. Question: Mr President, what is your vision of Peter the Great, who came to Versailles in 1717 to establish diplomatic relations? Vladimir Putin: As I have said to my French colleague and our French friends today, Peter the Great was above all a reformer, a man who not only implemented the best and the most up-to-date practices, but also was undoubtedly a patriot, who fought to secure for Russia the place it deserved in international affairs. But above all, he was committed to reforming his country, making it modern, resilient and forward-looking. He succeeded in many, if not all of his undertakings. He focused on research, education, culture, military affairs and statehood, leaving an immense legacy that Russia has been relying on to this day, let alone the fact that he founded my hometown, St Petersburg, which was the capital of Russia for many years. Question: You said that you recently met with Mr Macron. Did you have any expectations from the first meeting? You said that it is important to overcome the stage of mistrust. Is it over now? As for the main issue, the sanctions, can you say you reached any kind of understanding? Vladimir Putin: At any meeting, in any contacts, at any events of this level, especially if it is the first contact, there are always expectations. If there are no expectations, it is pointless to hold meetings of this kind. I certainly had expectations this time. I wanted to get a closer look, to learn first-hand the position of the incoming President of the French Republic on the key issues on the international agenda and on the development of bilateral relations. As the newly elected President takes office, he certainly has his own view of things, of bilateral relations, of international politics. Overall, I would say it is a very pragmatic view. We certainly have points for rapprochement, for joint work in key areas. Question: The implementation of the Minsk Agreements on Ukraine seems to have reached a deadlock. Have you managed to achieve any progress with President Macron towards the resolution of this conflict? Vladimir Putin: Progress in resolving any conflict, including the conflict in southeast Ukraine, can be achieved first and foremost by the conflicting parties. This conflict is internal – a Ukrainian conflict primarily. It occurred after an unconstitutional forceful seizure of power in Kiev in 2014. This is the source of all problems. The most important thing to do is to find the strength to negotiate with all the conflicting parties, and above all, I am confident that as they say, the ball is in the court of the official Kiev authorities. First of all, they must take care of implementing the Minsk agreements. Question: What could help achieve progress in this area? Can Russia put forth an initiative that will bring about peace? Vladimir Putin: This is what we keep talking about. We believe that the main condition is to withdraw the armed forces from the contact line. This is the first thing that must be done. The withdrawal has been completed in two areas, but this goal has not been reached in the third area. The Ukrainian authorities say this cannot be done because of the shooting there. But shooting will not stop unless troops and heavy weaponry pull back. Heavy weaponry must be withdrawn. This is a key priority. The second goal in the political sphere is to put into practice, at long last, the law on the special status of these regions, which the Ukrainian parliament has adopted. The law has been adopted but has not come into effect. The law on amnesty has been passed, but President Poroshenko has not signed it. The Minsk Agreements stipulate the social and economic rehabilitation in the self-proclaimed republics. Instead of doing this, Kiev has blockaded these territories. The blockade was initiated by the radicals who blocked the railway lines. At first, the Ukrainian President denounced their actions and said that he would restore order. However, he failed. Instead of continuing his efforts, he officially joined the blockade and issued an executive order to this effect. Can we speak of changes for the better in this situation? Regrettably, we have not seen any so far. Question: Let us forget about Eastern Europe for a minute and talk about the Middle East, primarily Syria. After Russia’s military intervention in September 2015, what do you think are the main solutions for Syria to get out of this long-term war? Vladimir Putin: First, I would like to note the constructive approach of Turkey and Iran, and, of course, the Syrian government, which, together with Russia, have managed to achieve a ceasefire. The ceasefire would not have been possible without the so-called Syrian armed opposition. It was the first and very important step towards peace. Another step, which is no less important, is the agreement on establishing the so-called de-escalation zones. Currently there are four such zones. We believe this is an extremely important milestone on the way to peace, if I can phrase it this way, because it is impossible to talk about a political settlement without stopping the bloodshed. Now, in my opinion, we are all facing a different task, which is technically and I would even say technologically completing the creation of these de-escalation zones, agreeing on their boundaries and how government bodies will function there, as well as how these de-escalation zones will communicate with the outside world. Incidentally, President Macron mentioned this when he was speaking about humanitarian aid convoys. Generally, I believe that the French President is right and it is one of the points of contact where we can cooperate with our French colleagues. Once the de-escalation zones are formalised, I do hope that at least some elements of cooperation will begin between the government and those people who will control the de-escalation zones. I really hope (and what I am about to say is very important) that these zones do not become a prototype for the future territorial division in Syria. On the contrary, I expect that these de-escalation zones, if peace is established, and the people who will be controlling them, will cooperate with the official Syrian authorities. This is how an environment of basic interaction and cooperation can and must be built. The next step is a purely political reconciliation and, if possible, the development of constitutional regulations, a constitution and holding elections. Question: Indeed, Russia and the other parties differ on the Syrian issue regarding primarily the fate of Bashar al-Assad, whom the Western countries have accused of using chemical weapons against his own people. Mr President, can you envision Syria’s political future without Bashar al-Assad? Vladimir Putin: I do not think I have the right to determine the political future of Syria, be it with or without al-Assad. This is for the Syrians themselves to decide. Nobody has the right to claim the rights that belong to the people of another country. This is the first thing I wanted to say. Do you have an additional question? Question: Yes, I do. You say that this is not your decision. However, this does not mean that Syria’s future is possible without al-Assad, does it? Vladimir Putin: As I have said, this is for the Syrian people to decide. You have mentioned allegations about the use of chemical weapons by the Syrian government. When the attack happened, we called on our American partners – and everyone else who considers this to be expedient – to send inspectors to the airfield from which the planes that dropped chemical bombs allegedly took off. If chemical weapons were used by President al-Assad’s official agencies, modern verification equipment would certainly find traces of this at the airfield. For certain. These traces would be found in the aircraft and at the airfield. However, everyone refused to conduct such an inspection. We also proposed sending inspectors to the site of the alleged chemical attack. But they refused as well, claiming that it was dangerous. Why is this dangerous if the attack was delivered at an area where peaceful civilians live and the healthy part of the armed opposition is deployed? In my opinion, the accusations have been made for the sole purpose of justifying the use of additional measures, including military ones, against al-Assad. That is all. There is no proof that al-Assad has used chemical weapons. We firmly believe that that this is a provocation. President al-Assad did not use chemical weapons. Question: Do you remember what President Macron said about the red lines with regard to chemical weapons? Do you agree with him? Moreover, I believe that this issue should be addressed on a broader scale. President Macron shares this view. No matter who uses chemical weapons against people and organisations, the international community must formulate a common policy and find a solution that would make the use of such weapons impossible for anyone. Question: After Donald Trump was elected president of the United States, many people spoke about a new era in Russian-US relations. However, these relations do not seem to have made a new start. The NATO leaders spoke about the Russian threat at their summit last week. Are you disappointed by the US attitude? Vladimir Putin: No, I am not. We had no special expectations. The US President is steering a traditional US policy. Of course, we remember that during his election campaign, and also after he was elected and assumed office, President Trump spoke about his intention to normalise the relationship with Russia and said that it cannot be any worse. We remember this. However, we also see and realise that the political situation in the United States is influenced by those who have lost the elections but refuse to accept their defeat, and who continue to use the anti-Russia card and various allegations most actively in the political infighting. This is why we are in no hurry, we are ready to wait, yet we strongly hope that Russian-US relations will become normal again sometime in the future. Question: In a perfect world, what would you expect the United States to do to improve relations with Russia? Vladimir Putin: There is no such thing as a perfect world, and there is no subjunctive mood in politics. I would like to answer the second part of your question, regarding plans to increase military spending by 2 percent or more. It is a fact that the US defence budget is larger than the defence budgets of all other countries taken together. This is why I understand the US President when he says that his NATO allies should take over part of this burden. It is a pragmatic and understandable approach. However, what attracted my attention is that the NATO leaders spoke at their summit about a desire to improve relations with Russia. Then why are they increasing their military spending? Whom are they planning to fight against? I see an inner contradiction here, although this is not our business. Let NATO decide who will pay and how much. We have our own defence to deal with, and we are working to ensure it reliably and with a view to the future. We feel confident. Question: However, regarding NATO, some of your neighbours want to ensure their security through NATO. Is this a sign of mistrust to you, something that causes a scandalous attitude? Vladimir Putin: For us this is a sign that our partners in Europe and in the United States are, pardon me, pursuing a short-sighted policy. They do not have the habit of looking one step ahead. Our Western partners have lost this habit. When the Soviet Union ceased to exist, Western politicians told us (it was not documented on paper but stated quite clearly) that NATO would not expand to the East. Some German politicians at the time even proposed creating a new security system in Europe that would involve the United States and, by the way, Russia. If that had been done, we would not have the problems we have had in recent years, which is NATO’s expansion to the East up to our borders, the advance of military infrastructure to our borders. Perhaps, the United States would not have unilaterally withdrawn from the Anti-Ballistic Missile Treaty. This treaty was a cornerstone of current and future security. The missile defence facilities in Europe – in Poland and Romania – would not have been built, which, undoubtedly, creates a threat to our strategic nuclear forces and disrupts the strategic balance – an extremely dangerous development for international security. Perhaps all this would not have happened. But it did, and we cannot rewind history, it is not a movie. We have to proceed from the current situation. In this respect, we need to think about what we want from the future. I think we all want security, peace, safety and cooperation. Therefore, we should not build up tensions or invent fictional threats from Russia, some hybrid warfare etc. You made these things up yourselves and now scare yourselves with them and even use them to plan your prospective policies. These policies have no prospects. The only possible future is in cooperation in all areas, including security issues. What is the major security problem today? Terrorism. There are bombings in Europe, in Paris, in Russia, in Belgium. There is a war in the Middle East. This is the main concern. But no, let us keep speculating on the threat from Russia. Question: You are saying that more could be done regarding terrorism and Islamism. But what exactly should be done and what can Russia do? And why is it so hard to work with Europe to achieve these goals? Vladimir Putin: Ask Europe. We are willing to cooperate, as I said a while ago at the 70th anniversary of the United Nations, when I called on all countries to unite their efforts to fight terrorism. However, this is a very complex issue. Look, after the Paris terrorist attack, a bloody and horrible event, President Hollande came to Russia and we agreed on cooperative actions. The Charles de Gaulle aircraft carrier approached the Syrian coast. Then, Francois headed to Washington, while the Charles de Gaulle left for the Suez Canal. So real cooperation with France ended before it even started. France is involved in operations there, but it is acting within the US-led coalition. Go figure who gives the orders, and who is not, who has a say, and what the agenda is. Russia is open to cooperation. It was also very difficult to agree on these issues with the US. Incidentally, we have been seeing some shifts lately; and there are actual results. I spoke to President Trump on the telephone, and he supported the idea, in general, of creating de-escalation zones. We are now considering how the interests of all the countries to the south of Syria can be best served, with consideration for the concerns of all the countries that face issues in this region. I am referring to Jordan, Israel and Syria itself. Of course, Russia is ready to heed what the United States and our European partners have to say. However, what we need is for the dialogue to be specific and concise, instead of empty talk about mutual claims and threats. There is a need for a real effort. Question: You are saying that they are the ones who need to decide and act, right? Vladimir Putin: That is exactly the way it is. Question: You have mentioned the United States. The allegations of Russia’s interference in the US presidential race raised a political storm in Washington. Similar allegations were also voiced in France. What is your response, especially against the backdrop of recent developments in the US? Vladimir Putin: I have already commented on this issue many times. There was a question on this topic from one of your colleagues today. He put it very cautiously at the news conference, saying that ‘there are allegations that Russian hackers…’ Who is making these allegations? Based on what? If these are just allegations, then these hackers could be from anywhere else and not necessarily from Russia. As President Trump once said, and I think that he was totally right when he said it could have been someone sitting on their bed or somebody intentionally inserted a flash drive with the name of a Russian national, or something like that. Anything is possible in this virtual world. Russia never engages in activities of this kind, and we do not need it. It makes no sense for us to do such things. What for? I have already spoken to three US Presidents. They come and go, but politics stay the same at all times. Do you know why? Because of the powerful bureaucracy. When a person is elected, they may have some ideas. Then people with briefcases arrive, well dressed, wearing dark suits, just like mine, except for the red tie, since they wear black or dark blue ones. These people start explaining how things are done. And instantly, everything changes. This is what happens with every administration. Changing things is not easy, and I say this without any irony. It is not that someone does not want to, but because it is a hard thing to do. Take Obama, a forward-thinking man, a liberal, a democrat. Did he not pledge to shut down Guantanamo before his election? But did he do it? No, he did not. And may I ask why not? Did he not want to do it? He wanted to, I am sure he did, but it did not work out. He sincerely wanted to do it, but did not succeed, since it turned out to be very complicated. This is not the main issue, however, even though it is important, since it is hard to fathom that people have been walking there in chains for decades without trial or investigation. Can you imagine France or Russia acting this way? This would have been a disaster. But it is possible in the United States and continues to this day. This refers to the question on democracy, by the way. I referred to this example just to show that it is not as simple as it may seem. That said, I am cautiously optimistic, and I think that we can and should be able to reach agreements on key issues. Question: You are saying that right now, the political storm in Washington rests on absolutely unsubstantiated allegations. Vladimir Putin: It is not based on allegations, but on the desire of those who lost the elections in the United States to at least improve their standing through anti-Russia attacks, by accusing Russia of interference. The people who lost the elections do not want to admit that they really lost, that the one who won was closer to the people and better understood what ordinary voters want. They are absolutely reluctant to admit this, and prefer deluding themselves and others into thinking it was not their fault, that their policy was correct, they did all the right things, but someone from the outside thwarted them. But it was not so. They just lost and they have to admit it. When they do, I think it will be easier for us to work. However, the fact that this is being done using anti-Russia tools is not good, as it brings discord into international affairs. Let them argue among themselves, so they can prove who is stronger, who is better, who is smarter, who is more reliable and who sets a better policy for the country. Why involve third countries? This is very distressing. But it will pass, everything passes, and this will pass as well. Question: Mr President, we are close to the end of our interview. Most of all I would like to ask you a question about 2018. This is the year of elections in Russia – presidential elections, and elections to the Federal Assembly. Could you tell us if you intend to run, o perhaps the opposition would be able to nominate someone in a democratic procedure? How do you see the development of this situation? You do want next year’s campaign to unfold in a truly democratic environment, don’t you? I am talking about 2018. Vladimir Putin: All the recent election campaigns in Russia have been in strict accordance with the Russian Constitution, in strict compliance. And I will make every effort to ensure that the 2018 election campaigns are conducted in the same way, I repeat, in strict accordance with the law and the Constitution. So anyone entitled to run, anyone who fulfils the relevant procedures prescribed by law, can and will participate, if they wish, in elections at all levels – to legislative assemblies, to parliament, and in presidential elections. As for the candidates, it is still too early to talk about it. Question: Thank you. I hope we will see you soon, thank you very much for sharing your views with Le Figaro.